The Stoller Hall is an exceptional new venue for music and performance in the heart of Manchester. With a diverse artistic programme spanning all genres, from classical music and folk to spoken word to comedy, and a central location in one of the UK’s most vibrant and exciting cities, The Stoller Hall makes a great brand partner. Sponsorship with The Stoller Hall will not only bring you closer to the incredible music we produce, but will also see your brand at the forefront of The Stoller Hall’s messaging. · Complimentary tickets to our diverse programme of performances, ranging from classical music to stand up comedy. · Complimentary drinks for you and your guests in our private reception area. · Significant brand exposure alongside all publicity relating to our new concert hall, The Stoller Hall. 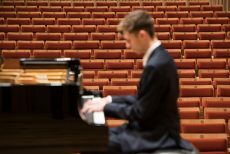 · Priority booking for events at The Stoller Hall. · The opportunity to achieve your Corporate Social Responsibility goals by supporting the music stars of tomorrow. For further details on how sponsorship can directly benefit your business, please contact Jessica Hilton on 0161 838 7206, or email jessicahilton@chethams.com.